Note: This article also refers to the AWR Website Auditor, a feature that is no longer available in AWR Cloud. As your business grows, so does the amount of data you collect in order to track your performance. When this happens, spotting opportunities and making the right decisions can become challenging. This is why our new AWR Cloud update focuses on visualization, depicting measurable, actionable information and helping you analyze large amounts of data faster. This release enriches the Social menu with two new views: Twitter and Facebook, allowing you to see comprehensive graphs and interesting details that may help you quickly grow engagement with your fans. And all you need to do to gain access to this data is connect AWR Cloud with your social media profiles. The new view offers global stats for your account, like the number of followers and lists you are on, as well as actionable insights about your latest followers and reactions to your activity. 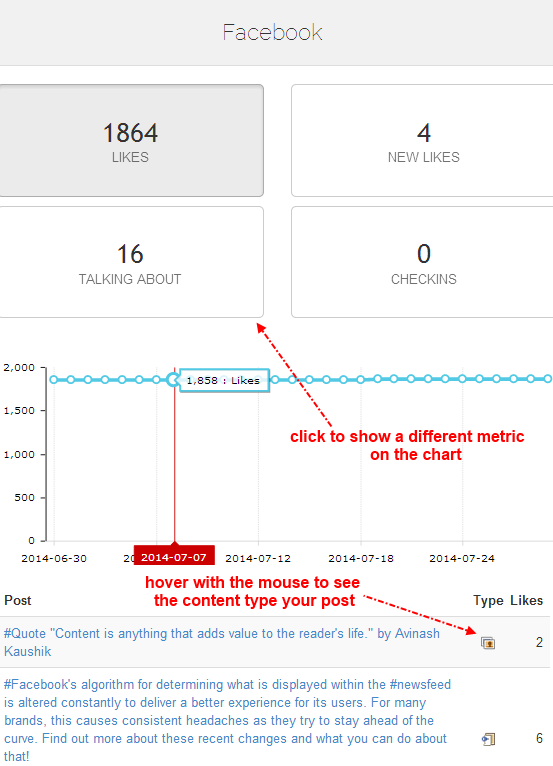 Now, you can see the posts that were published on your pages, their content type and the number of likes each post received. Each time you open the Social views, stats are updated live, giving you the chance to respond to your audience in real time. 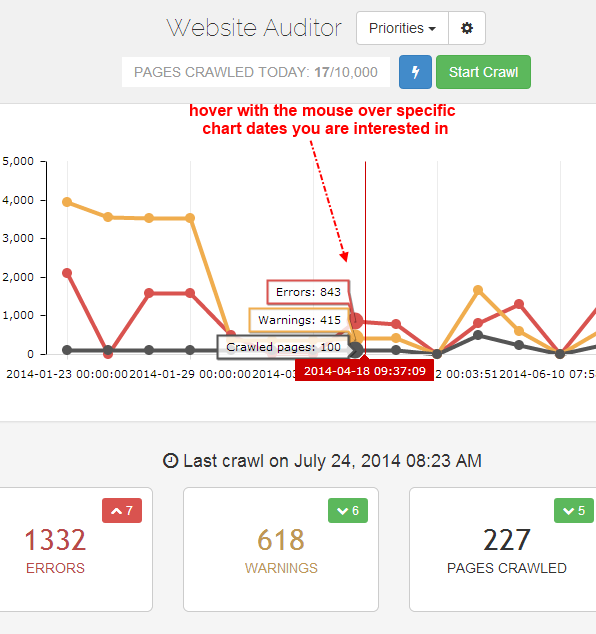 We added a beautiful chart for the Website Auditor tool, to help you keep an eye on your on-page optimization efforts. You can see the evolution in time of the errors and warnings found, as well as the number of pages analyzed on the last 15 crawls. The chart will become visible in a project when at least two crawls were performed. 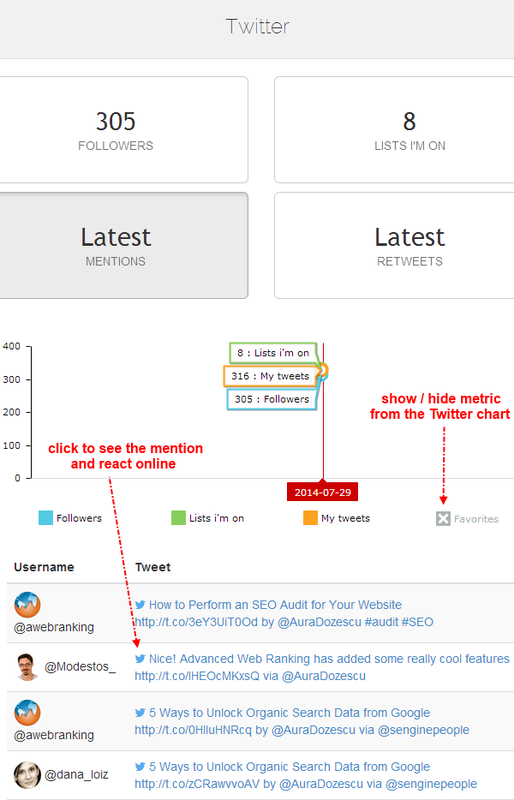 Now, you can easily track your progress when starting a new SEO project. 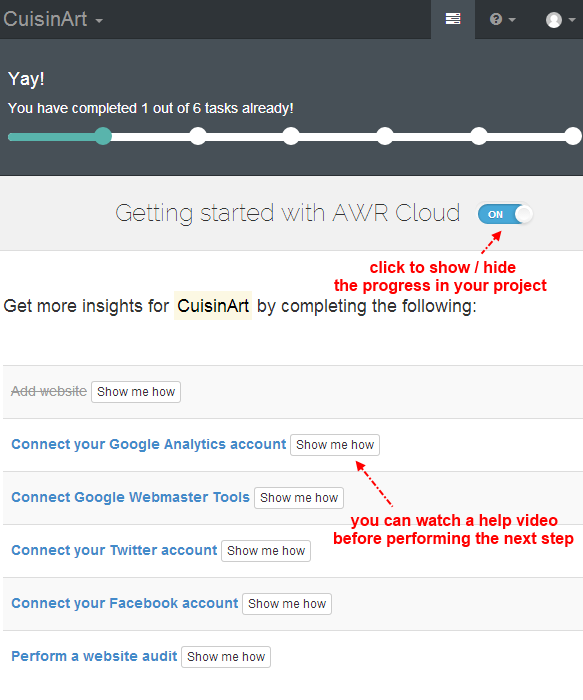 Once you add the website to AWR Cloud, the Getting started progress bar becomes visible in all pages of your new project. Simply click on each step and connect AWR Cloud with all data sources available in the application. 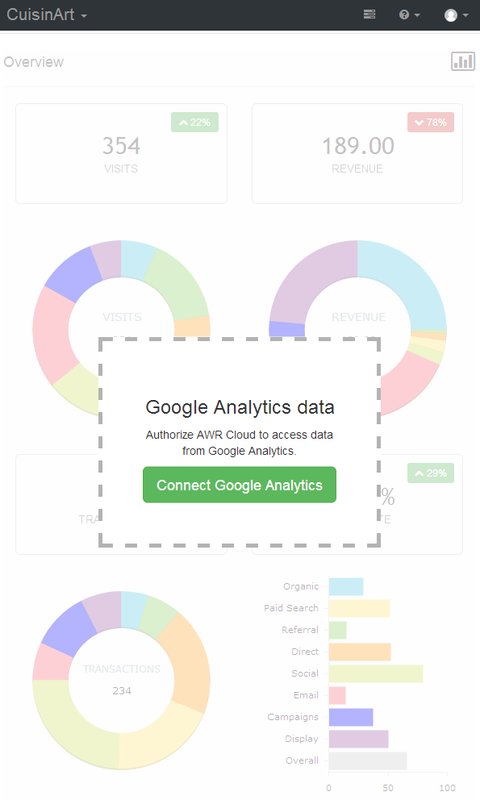 This way, you’ll be able to quickly complete the setup and start gathering fresh data for your website. If you ever hesitated to synchronize your AWR Cloud account with your Analytics or Webmaster Tools profiles because you didn’t know what data would be retrieved, or how it would look like for clients you invited to join AWR Cloud, now you don’t have to worry about this any more! You can now see how some boards and reports may look like before deciding to synchronize AWR Cloud with other data providers, with the help of the new dummy data introduced in this release. If you are managing large sets of keywords with AWR Cloud, you can now get a quick overview of your rank tracking performance by using the Top Positions view. the number of keywords for which you are not currently ranking. The data can be displayed across all search engines monitored, or only for the selected search engine. We added two new frequencies to the report scheduler. 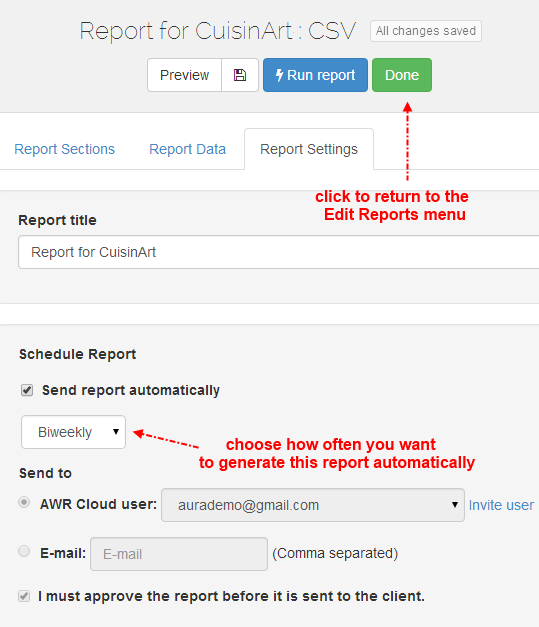 Now, you can generate reports automatically with AWR Cloud daily, weekly, biweekly or monthly. To change your reporting frequency, navigate to the Reports -> Edit Reports menu and open the report editor you are interested in, then click on the Report Settings tab. When working with the Biweekly frequency, your report will be generated automatically on the first and third Wednesday of each month, simultaneously with the biweekly ranking update. 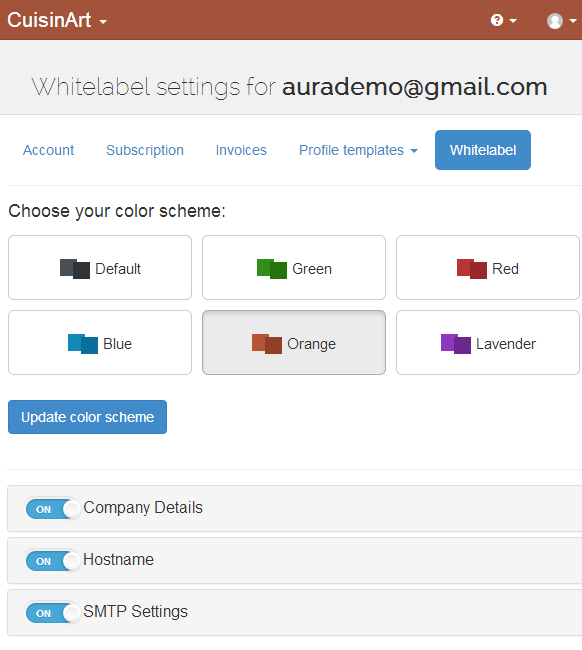 Now, you can personalize your AWR Cloud account by choosing one of the color schemes available in the Settings -> Account Settings -> Whitelabel screen. The updated scheme will change the color of the top bar and highlighted menus for your account and for all users that you are currently managing in AWR Cloud. That’s about it, for now. I hope we added something you like! Feel free to share your thoughts in the comments section below. As always, you’ll find much more goodies inside AWR Cloud. Love the updates – AWR has been massively impressing us with their simple to use interface, value for money and amazing customer service!! I would recommend it to everyone! Looking forward to the next updates! Maybe improved PPC reporting? Thank you very much for your feedback 🙂 We’d love to start a conversation with you and find out what your needs are. Please send us an email at help@awrcloud.com with your reporting requirements.